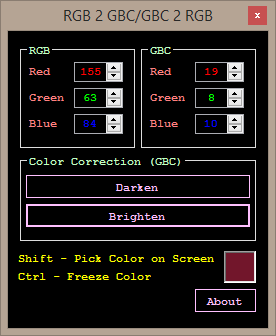 This is a color ripper to get the exact color you see on your computer screen. I couldn’t find any utility for this so I decided to make my own… It’s a simple program. To run it, it requires .NET Framework 2.0 or higher runtime to work. It’s very user friendly. It calculates in real-time and comes with a color corrector if the color is either too bright or too dark. I hope someone could find this useful for color restoration hacks or customizing a character’s colors in a game. Hope you guys like it.